From what I've seen and heard so far, there're still some people who truely want to learn some skills and help themselves, maybe even others. That's why I'm making this tutorial. If you're completely new to this area, read the above topics in order. If there'd be any questions, comment under the corresponding topic. Last edited by Bigchillghost on Thu Feb 21, 2019 7:50 am, edited 8 times in total. float: a 4-byte unit used to represent floating point numbers like 3.141593, etc. If you don't understand the above definitions, read the introduction in The Definitive Guide to Exploring File Formats, or ask google for help, and come back later. BTW, you could read the explanation about endianess in advance, still I'll explain it when necessary. Read the 3D Model Glossary to gain an understanding of these concepts. You don't have to learn all the terms it mentioned at present. Return to the main tutorial. Last edited by Bigchillghost on Mon Mar 11, 2019 12:06 pm, edited 6 times in total. In this part, I'll briefly explain how Hex2Obj works. You only need to have an overview of the entire process. I'll explain how to use it later. litE/bigE: Switch of endianness, little endian by default. Word/DW: Data type of the face indices. Most games use Word/Short for storage of the indices, which can represent up to 65,535 verts. When a model contains more than that amount of vertices, it'll need larger 4-byte integer to define the indicies, and that's what we call a Dword (DW). seq/VB: Two modes for how you want the tool to parse the vertex data. In most of the cases you'll be using the latter. noStr/Strip: How the vertices are connected: triangles/triangle strips. std/FFFF: How the tristrips are terminated. noPtC/PtCld: Whether to display the model as a point cloud or not. 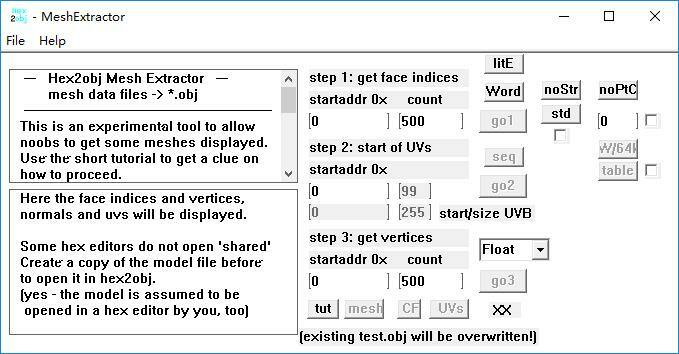 go1: When pressed it displays the indices of the vertices in each face in the lower left window and show the calculated vertex count. go2: When pressed it displays the values of the UV coordinates. go3: When pressed it displays the values of the vertex position coordinates, but it's only accessable in seq mode. mesh: To display the model in the mesh viewer. UVs: To display the UVs as a flatten mesh. Data Type Rollout ("Float"): Offering different data types used to define the vertices. So basically you've known what is needed for building a simple 3D model after you finished your preparation work in Part I: vertices coordinates, vertex normals, vertex UVs and face indices. and the offset of the UVs, so that Hex2Obj can access to the corresponding data appropriately. That's not hard to understand though. However the file endianness and varied data types being used will result in different combinations of parameters for correctly using the tool. That's what makes most newbies feel it so hard. To get the tool work, we just need to fill in all the required info and choose the coresponding parameters. Last edited by Bigchillghost on Mon Mar 11, 2019 12:31 pm, edited 5 times in total. It's never a bad idea to teach yourself a real programming language, especially if you don't want to extract all models via Hex2Obj manually. And C seems to be a good option. It's efficient, and easy to learn. There're already a lot of online tutorials available on the Internet, so I won't explore the details here. Last edited by Bigchillghost on Mon Mar 11, 2019 12:43 pm, edited 2 times in total. 4. Write a model extractor in C.
4. If it's still too dificult to solve, you might have to leave it alone for now.